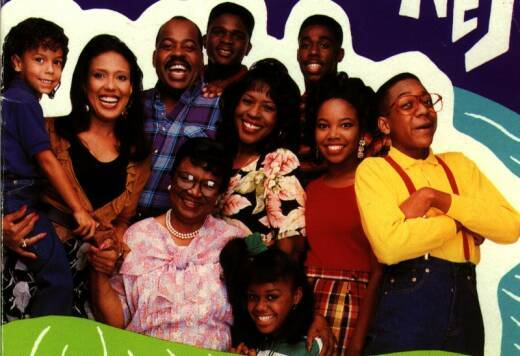 Welcome to a fanpage for the sitcom "Family Matters". On this site you can find a text about the plot, bios of the castmembers, links, articles (with pictures) an episode guide, songs like the Urkeldance and over 800 pictures. You can also check out my Kellie Williams Fanpage with even more texts and photos. You can sign or view the guestbook. Furthermore information about "Grown Ups" in which Jaleel White (Urkel) starred and a website about "What About Joan" with Kellie Williams (Laura). If only their house was as big as their hearts! Seven years ago, Harriette and Carl Winslow generously invited Harriette's nephew to move into the small home they shared with their two children in suburban Chicago. The scourge of Carl's existence -- his imperious mother -- moved in soon after. As if that weren't enough, the Winslows have since made room for Steve Urkel, a nerdy, irksome family friend who has taken up residence because his parents left the country without him. Now under one bulging roof, this extended family of seven redefines the word "togetherness" as their home splits at the seams with chaos, confusion and laughter. "Family Matters," a Bickley & Warren Production, a Miller*Boyett Production in association with Warner Bros. Television, is now in its seventh season (premiered September 22, 1989). The series stars Reginald VelJohnson, JoMarie Payton Noble, Rosetta LeNoire, Darius McCrary, Kellie Shanygne Williams, Bryton McClure, Jaleel White and Shawn Harrison is broadcast Fridays (8:00-8:30 PM, PT) on the ABC Television Network. Harriette (Payton) and Carl Winslow (VelJohnson) are the backbone of this odd brood. The dry-witted Harriette, who some might say wears the pants in the family, has her hands full with not only working full-time at a department store but also tending to the needs of her ever-growing family. Carl, a tough Chicago cop, is a teddy bear of a man in a grizzly's body. Like many dads, he is beleaguered, put-upon and taken for granted, and charged with putting bread on the table, doing household repairs and suffering the traditional "slings and arrows" of fatherhood, such as tax return preparation, hormonal teenagers, and the annoying and inventively irritating suitor of his daughter, Steve Urkel (White). Completing the Winslow family is Mother Winslow (LeNoire) and Richie Crawford (McClure), Harriette and Carl's eight-year-old nephew. Mother Winslow, Carl's mother, possesses a fresh, open-minded attitude towards life that endears her to the grandchildren but confounds her son. Carl (whose lack of extraordinary talent, incidentally, is a regular target for her acerbic critical remarks). An outspoken and opinionated matriarch, Mother Winslow's special brand of wisdom and understanding provides the family with history and texture. Harriette and Carl's offspring include Eddie (McCrary) and Laura (Williams). Eddie, 19, is a typical, hormonal college guy whose interests include hanging out with his buddy Waldo Faldo (Harrison) -- who has a heart of gold and a head full of air -- girls, teasing his sisters, girls, testing his parents' patience and girls. Laura is a bright and gregarious 18-year-old who has clearly inherited her mother's take-charge personality and clever wit. Like Eddie, Laura is occupied by the trials and tribulations of dating -- that is, when she's not busy dodging the relentlessly lovesick Urkel. A brainy, cheese-fixated nerd, Urkel, 18, burst into the Winslow's house five-and-a-half years ago, worming his way into the Winslow household before they knew what hit them. A constant source of irritation to friends and strangers alike, Urkel is madly in love with Laura and hopeful that she will return his devotion one day; unfortunately for him, that day isn't coming anytime soon, so for the moment he has lent his heart to his equally cerebral, jealous girlfriend Myra (Michelle Thompson). As for Carl, no matter how hard he tries to avoid Urkel, he is often the victim of the young man's string of mishaps and accidents. With such diverse personalities, needs and hopes crowded under one roof, it's no wonder there's always something wonderful or weird going on, which is what makes "Family Matters" the unique slice of middle-class Americana that it is. And as the Winslows brace themselves for life's inevitable ups and downs, they continually prove that what matters most is family. Thomas L. Miller, Robert L. Boyett, William Bickley, Michael Warren and David W. Duclon are the executive producers. Reginald VelJohnson played the role of the understanding Sgt. Al Powell opposite Bruce Willis in "Die Hard." He also starred in "Die Hard II" Here you can get the dvd's. 14 Dec.: about 70 small pictures added for: Telma Hopkins, Jaleel White, Darius McCrary, Kellie Williams and Reginald VelJohnson. Interview with Telma Hopkins (12 Nov) added and new biography and filmography.